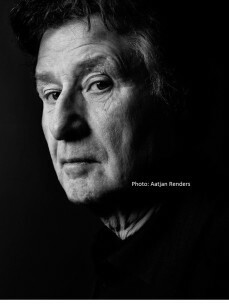 Jaap Drupsteen (1942) is a (motion) graphics designer and a music-TV director. He started his carrier at NOS-TV and VPRO Television, and was a jazz bass player in between. His professional field of action is wide and adventurous, varying from avant garde music theatre TV productions to security printing design and design for architecture. He designed the last series of bank notes and the passports of The Netherlands. Jaap Drupsteen is regarded as a pioneer in electronic motion graphics. He designed and directed graphics for TV-identity, and several international musico-dramatic TV-productions, based on videographic techniques, i.e. for VPRO, NOS, TROS, SWF, ZDF and ORF. He also developed methods for sychronized control of music visualization to live performances with (i.e.) the Royal Concertgebouw Orchestra, Radio Philharmonic Orchestra, Radio Chamber Orchestra, De Volharding, Asko Schönberg and several smaller music groups, i.e. mapped video projections onto organs with organist Aart Bergwerff. He often works in direct co-operation with composers like Louis Andriessen, Jacob TV, Joe Cutler, Geert van Keulen, electro-music wizzard Piet Jan Blauw and singer/songwriter/multi-instrumentalist Fay Lovsky. For his his own performing groups he composed motion graphics and rhythms simultaniously. In cooperation with (Videosync) tech-wizzards Mattijs Kneppers and Hidde de Jong he develops live sync-to-the-beat audiovisual productions. His visuals perform live synchronized at Dance Festivals, like Voltt, Dekmantel, Atak Basic Grooves and Gogbot Festival. Recent sync works are exposed at Rijksmuseum Twenthe untill November 6th 2016. TV-critic's Nipkow Award, Prix Italia, Werkman Design Award, Sikkens Award, L.J.Jordaan Award, Alblas Award, Holland Video Award, Prix Sacem du Louvre.